How to grow borage is useful knowledge, not only for growing a medicinal herb, but also a vegetable. Although it is not commonly known as one now, borage was a vegetable once. During the nineteenth century, people used to boil the young tops of Borage as a pot herb. Also the fresh leaves of Borage were once popular in salads, the leaves having a slight fragrance of cucumber. In far earlier times, Borage was believed to be good for driving away melancholy and it is still used to help ease depression. Only the leaves and flowers are used. Gather the leaves when Borage is just starting to bloom, on a sunny day just as the dew has dried off. Strip off the leaves one by one and only keep those leaves that are not stained or insect-eaten. Harvest the leaves just before using them. Borage is useful for fevers and pulmonary complaints. It can be used as a diuretic. It will also soothe an irritated throat and ease the irritation causing a cough. The herb has a soothing and softening effect on your skin. You can also make a poultice out of Borage to ease inflammatory swellings. Borage will help heal mouth infections. It can also help clear your skin and promote healthy skin growth. Borage is useful for balancing hormones and eases both depression and inflammation and works as a mild sedative. Don't use borage if you are prone to developing kidney stones. You can make a summer drink out of borage by seeping the leaves in water and then adding lemon, sugar and a little wine. The flowers can be candied. Borage is a great source of potassium and calcium so add them to your salad or boil them and serve as a side dish. Ordinary soil will work fine for growing borage, but if you start it from seed, then you will need a light soil. Sow your seeds after the last danger of frost. 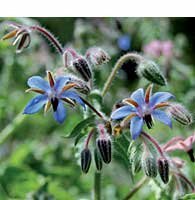 Borage is a perennial and will reseed itself once it is established. If your plants get tall and spindly, cut them back in late summer. You can also sow borage in autumn, although they won't flower until May.